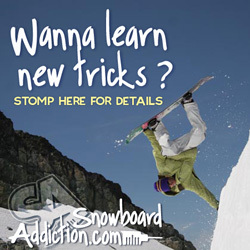 Find info and definitions regarding Freestyle Snowboarding Features. I will cover the different types of terrain you would find in Terrain Parks, in the Urban Riding Environment and Street Style features, as well as Natural Terrain on Mountains and in the BackCountry. A Table Top jump is called that because the deck of the jump is flat like a table. The deck usually also begins right at, or just a little bit below the takeoff of the jump. A table tops are great and are nice to learn tricks on because if you come up short you will not fall to far before you hit the deck or knuckle (curved transition from deck to landing) and if you land in the sweet spot of the landing the landing will hit you fairly softly, so that if your off balance or not landing on your feet there is a lower risk of injury. The Step Up style jump is sooo fun. It feels like you have to go really fast into it, to get up over the deck and make it to the landing. The step up jump is even more forgiving than a table and as a result amazing for learning flip tricks that you know you may not land on your feel. You only drop a little ways to the landing so the impact is even less than on a table. Whether you land on your feet or on your hip a step up landing feels like it "catches you" nice and soft. The step down jump became very popular for parks and big air jumps in the past decade. Many like the step down type jump more because the rider has more hang time and is further off the ground so it looks cooler or more dramatic. However, it does have a higher risk factor. If you come up short, you fall further before you hit the knuckle which increases chances of injury. Even if you hit the sweet spot, which can be perfect in pitch, grooming and stomp-ability, at touch down the impact and momentum are higher, which raises potential for injury, than the landing of a Table Top or Step Up. So it is important to learn tricks and develop confidence in your ability to land the move on your feet and in control before taking it to a step down jump. Just a slang name for the appearance of the takepff of a step down jump. Often park builders will build the takeoff as a wedge that rises up off of the deck of the jump, which makes it look like a cheese wedge. Backcountry riders also build cheese wedges in the backcountry to launch themselves to a rolling landing 30-100+ feet away. Dang. Quarterpipes are so fun! Most Quarterpipes are around 10-20 feet tall and are built using a combination of halfpipe shapers, snow cats, transition shovels, rakes and manpower. They can be a challenge to build but are well worth the work. Most Quarterpipe go up to a vertical take off that is just barely less than vertical. 1 or 2 degrees less than 90 degree vertical is usually best. That way the rider can pop a little and still land high on the wall. Sometimes park crews will set up a wall ride up on top of a quarterpipe. That can be super fun too. Usually the wall ride is not set up until the original near vertical shape of the quarterpipe melts back a bit so that the lip is mush less than vert. Layed back even. This way the wall ride can be set layed back as well, which makes it more ridable. Wall rides are good for buttery slides and rotations on the wall, or for skate style stalls and hand plants closer to the coping or top edge of the wall ride. Other objects such as logs, barrels, mascots, and such can be used on banks and quarterpipes to add features for stalls or bonk variations to the up and down motion of a quarterpipe. Having become more and more common at the bigger ski resorts across the country, halfpipes have progressed by leaps and bounds over the past 15 years. 15 years ago a halfpipe was just a pair of banks with highway hits or little kickers to launch off of. They were all different. Some had turns, some had lift towers growing out of the wall, some had built in quarterpipes at the bottom and they were all fun, for their day. Today the halfpipes are immaculate. Becoming more uniform the pipes of today are cut with refined transition shaping machines attached to snow cats. Unlike the skate ramp, builders are contantly battling Mother Nature in the attempt to provide a finished product that will be easy to maintain and and last through the winter. Usually just a high spot or mound at the top of the pipe that serves as both a drop in to gain speed for dropping into the haflpipe and as a staging area for the line-up of usual traffic or for an event. The decks are at least a cat wide (about 20-30 feet) on each side of the lips of the halfpipe. Each time the halfpipe is cut you lose 6 inches of width, more or less depending on condition of halfpipe. So, it is important that the decks are nice and wide when the pipe is built, so that the pipe will last the winter. Although it is called the flat bottom, when a pipe is cuts its very best, like it would be for a big event or demonstration, the flat bottom is a smooth round arc that blends the 2 wall transitions, like in the diagram above. However, when it is not a contest cut, most pipes do have a fairly flat bottom and often a little bit of a kink where the flat bottom meets the cut transition. This kink is called a gutter because it resembles a gutter on the side of a street. The arcing shape made by the wall of the halfpipe between the flat bottom and the lip or vert. The Lip of the halfpipe is essentially the corner or knuckle made between the wall and the deck of the halfpipe. Focus on the lip is essential in the timing of release into tricks. I Love Hips. They are so simple and so incredibly fun. Take a big hip, with a landing which starts as little as right behind the takeoff and has a sweet spot that goes for 50-60 feet along the top of the hip landing. You can start really slow and just make it off the thing, then go faster and faster hit by hit. Starting a little higher each time. Until you are flying into it. It is such a fun process. I have had some of the biggest airs of my life off of Hips and I'm sure I am not the only one who feels that way. A hip is basically a jump take-off with a landing that goes off to the side in relation to the trajectory of the rider. Some Hips are set up like the diagram above where they have a take off and 2 landings. Most of the time though in parks and in the back country hips have a take off and 1 landing, either to the right or to the left. In the backcountry, you will find them where there is a gully that is banked on the sides. Coming from either inside the gully or from on top of the ridge a hip take off may be built to send the rider skyward, then land back inside the gully on the bank. Hitting a hip backside requires around 45-100 degrees of backside rotation. It looks and feels somewhat like a backside air in the halfpipe. However the take off can be a little tricky. Depending on the shape of the takeoff, a Backside air if often done slightly off the toes. This is due to the fact that the rider must take off towards the landing, which is to the side and may require a toe take off. This seems a little weird at first, but it can get comfortable. Hitting a hip frontside requires around 45-100 degrees of frontside rotation. It looks and feels somewhat like a frontside air in the halfpipe. However the take off can be a little tricky. Depending on the shape of the takeoff, a Frontside air if often done slightly off the heels. This is due to the fact that the rider must take off towards the landing, which is to the side and may require a heel take off. Again, feels a little weird, but you can get used to it, and boost. As shown in the digram above, a spine is a pair of matching transitions that usually puts the rider in the air straight over the spin to stall at the peak of hang time, then drop back down into the landing on the other side. Common in Skateboard and BMX parks, they are also great fun on a snowboard. Spins are usually 10-15 feet tall and can be set up across the fall line so that you hit it straight up and go stright over the top, or with the fall line so that you hit it from one side or the other, pause in the hangtime, then drop into the landing on the other side. Both types are comomonly used as a feature on boardercross tracks. A bank is just that a bank of snow. Sometimes to turn against and direct the flow of traffic, and sometimes with a box or jib on on the top edge to jib or slide. A berm is like a bank except that it has a more defined turn and arcing shape. Used in motocross, the berm traslates directly to the boardercross course. The Mount Baker Banked Slalom , is a good example of riding berms. It is a berm contest and very cool. Another common sight in boardercross coaurses as well as in parks are rollers. Usually set up in sets of 2-6 in a row, rollers are great fun. A rider may pump through the rollers or double them by airing from the front of one over the trough between it and the next, to land on the back of the second roller. Pumping, doubling and even tripling are all common terms and activities in a boardercross race to generate speed and attempt to stay in front or pass the competition. A rail is a metal sliding surface that the rider will hop or jump onto to slide or grind. A box is a general term describing a wider sliding surface. A box style feature may or may not have sides that actually make it a box. A box with just one center support underneath a wide sliding surface may also be called a platter. Often the sliding surface of a box or platter is made up of skatelight, masonight or a hard plastic. A rail or box shaped like a Rainbow. Nice! A Box or Rail meant to simulate a Urban style handrail. Usually set up so that the rider will jump onto the Rail or Box from the side instead of over the top. A cannon is a box or rail set up on the end of, and off the back of a jump takeoff. The box or rail will hang out over the deck of the jump and the feature matches the trajectory that a rider would take if it was just the jump by itself. The rider slides the cannon and then blasts off of it with speed enough to clear the jump deck and land on the jump landing. Called a Canon because, well, use your imagination. A high rail is just that, a high rail. Commonly set up with a larger gap onto it the high rail requires good speed judging skills and total confidence. Coming up short jumping onto a high rail could end your season real quick. A Box or Rail with a C shape. The cruved rails and platters are so fun and have their own feel. It takes time and progression to gain confidence with this type of feature. Once master a rider might do any trick or variation they would on a straight feature. A Box or Rail an S shape. C and S rails sometimes also have a little rise and fall mixed into the feature. This adds to the feeling being on a ride. A RollerCoaster Rail or Box is like a rainbow into a jump or kicker type transition at the end. It is like an S on its side, and allows the rider to do all kinds of spin or even flip tricks off the end of the Box or Rail. We had one in Steamboat once and we called it the "Rainbow-Nana". Get It? A cornice is a wind built feature that occurs on a ridge-line or shelf in the natural terrain. The wind blows up one side of the mountain and as it curls over the ridge it deposits snow on the back side of the ridge until it grows into an overhanging snowbank. Cornices are so fun to jump off of. They can be as little a 1 or 2 feet and as big as 40-50 feet, then if it's really steep below, the air potential is unlimited. A Wind Lip is another naturally forming Freestyle Snowboarding Feature that is built by the wind. This time the wind is blowing up hill and forms a cornice on a roll or hump on the hillside. The cornice that forms a wind lip faces uphill and has room to get speed up above it. People will cut back the cornices' curl to leave a kicker takeoff that sends the rider up and over the ridge that the cornice is formed on to land on the backside of the wind lip or roller. Many Wind Lips like the one at Whistler BC are location for some of the biggest airs of all time. Big wind lips usually have a massive transition into the takeoff, then a gentle roll to a landing that is super steep. This allows for confident takeoffs and huge hangtime. Natural terrain, snow storms and wind can sculpt some incredible natural freestyle snowboarding features. Huge Powdery Quarterpipes and Hips? Yes, it sounds like heaven doesn't it.